The biggest single-day gain in eight months for BSC (Bombay Stock Exchange) index surged around 700 points. The biggest nationalized banks such as Union Bank of India and United Bank of India cut their BLR (Base Lending Rates) on the same day. Moreover, the newspapers passed a vital headline about “RBI cuts key interest rate.” What is key interest or repo rate? Let’s know more about that in this article. 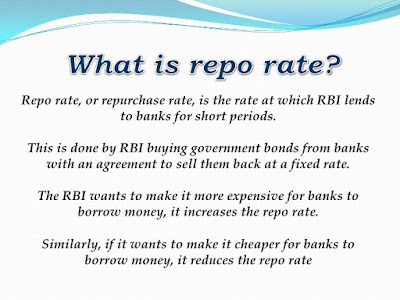 First of all, you must know what is Repo Rate? When we take loan from bank, the bank charges a definite interest rate on particular loan. It is known as cost of credit. Likewise, when banks require money, they approach to Reserve Bank of India. 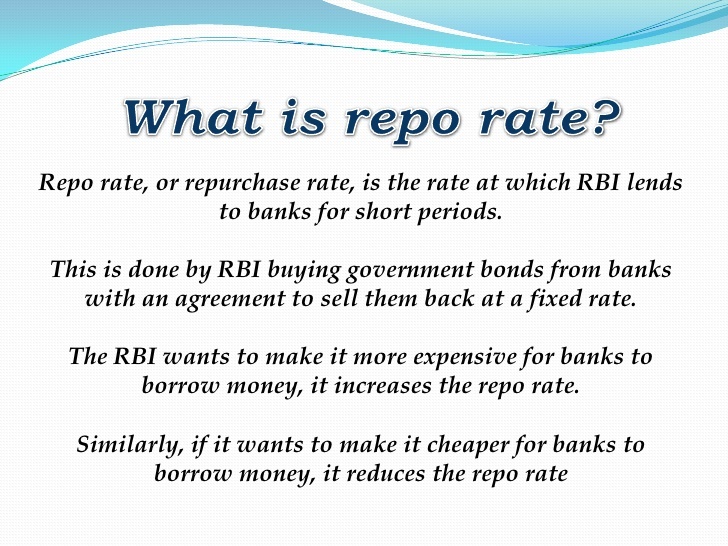 The rate at which banks borrow money from Reserve Bank of India by retailing their surplus government securities to the RBI is called “Repo Rate”. The full form of Repo Rate is Repurchase Rate. For example, if REPO rate is 8% and bank takes loan of Rs 1000 from Reserve Bank of India, then they will pay Rs 80 to the RBI. 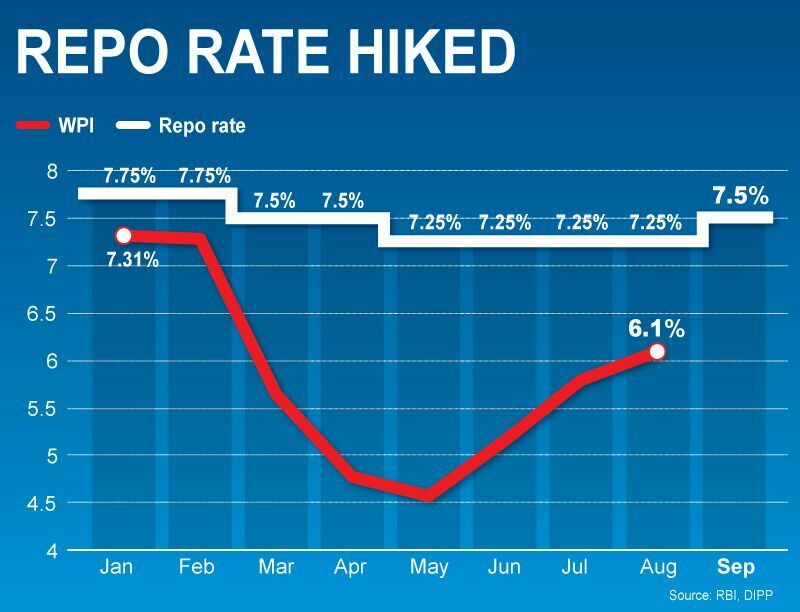 Moreover, the current repo rate is 7.75% as of January 2015. 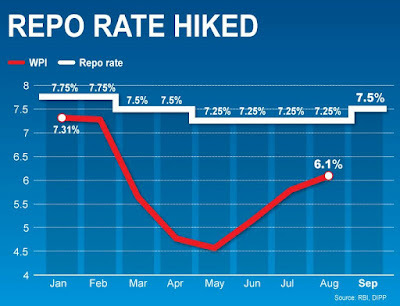 The Reserve Bank of India has cut Repo Rate by 50 basis points 0.25% on 30th September, 2015.The RBI governor has surprisingly cut the interest rates for the first time in almost 2 years. So, if the repo rate is low, banks have to pay lower interest amount on their loan. Ultimately, it helps us to pay lower interest rates on the loans taken from bank. The RBI Repo Rate cut will effect on deposit rates, landing rates, money supply in economy, economic growth and buying power of customers. The state run lenders United Bank of India and Union Bank of India were the first who cut their Base Lending Rate by 0.25% to 10%. In addition, the state bank of India has previously cut its Deposit Rates indicating the plunging trend of the home loan or lending interest rates. Here are the benefits or impact of RBI Repo Rate cut. 1. It doesn’t mean that the RBI Repo Rate Cut will benefit the borrowers immediately.The banker must lower the Base Lending Rate first. If your bank does so, then only your loan EMI will be reduced. 2. These rate cuts will not effect on Fixed Rate Home Loans or Fixed Rate Consumer Loans. 3. The current bank customers who have taken loans can notice their Loan Tenures or Loan EMIs reducing. However, by default the banks lower the loan tenure instead of loan EMI. So, your monthly EMI installment amount persist the same. In addition, the rate cut will make a considerable difference if the enduring loan term or tenure is very long. 4. If you don’t know about your EMI status whether it is reduced or not, you must contact your banker or lender to rearrange the term and conditions. In addition, remember to submit the new ECS instruction for new EMI amount. 5. Moreover, if you are planning to obtain a property through a home loan, then wait for some more time as the home loan interest rates may moderate even more in this year 2015. It may fall below 10%. 6. At present, don’t go forward to switch to a different lender or switch to different home loan plan with the same lender.It may be just a starting of falling the interest rate phase. 7. A home loan EMI has two mechanisms including the interest and principal.The interest mechanism is greater in the early years, so a minor change in the interest rate can have a big influence.Moreover, as the loan period develops the principal mechanism increases. So, when the principal becomes higher, swapping to a lower rate has negligible influence. 8. If you are having a fixed rate home loan over 13% or so, it would be acceptable to change to a floating rate loan. Here are the existing and new interest rates of home loan with an example. Furthermore, unlike the home loans which have floating rate, most auto loans have fixed rate. Ultimately, present customers are unlikely to benefit from falling interest rates. However, the new buyers can profit from lower rates over five or seven year tenure. In addition, the other kind of loans and small ticket size loans for consumer will fall down as the banks begin reducing the base rates.